As a family with three young children, it is not often that we manage to find an activity that is equally absorbing for all of us. In the past, we have found walking a very good solution, but outside of this we can end up in a conflict of play park vs culture. If there is one thing that my daughters are passionate about, it is crafting. Colouring, sticking, gluing you name it, it will occupy them for hours. My husband, having long since resigned himself to the a life in a predominantly female household, has adapted well, but there is only so long that such activities will hold his attention before he starts to roam. And if I’m honest, there’s only so much time can spend drawing rainbows before I get restless. 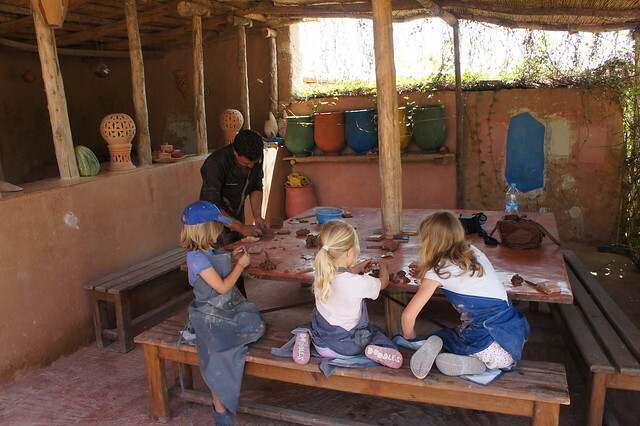 So, it was with a certain amount of hesitation that I suggested a family pottery class on our last holiday in Morocco. The girls were enthusiastic, my husband was agreeable and I was slightly unsure. We are very good about going walking together, or playing on the beach, but would it be possible to find an activity that would absorb the adults without going over the children’s heads? We met our teacher in the workshop. He spoke not a work of English but had a wide grin, he didn’t even grit his teeth (visibly) when my three year old nearly sent all of his pottery samples flying. Our first activity was to make a pot on the wheel, Patrick Swayze eat your heart out. Our teacher patiently demonstrated the technique to us and then we each had a turn. Some of the children were more enthusiastic than others, but everyone had a go, with a reasonable amount of success. None of us were naturals, but we definitely got full marks for enthusiasm. Surprisingly, despite the fact that only one of us could have a go at a time, the children were happy to stand and watch each other. Flushed with our success at the pottery wheel, we then moved to a table to start making pots, which evolved into lanterns. Again, our teacher demonstrated the technique and we were then left to create, with him gently interjecting from time to time to refine our creations. Admittedly the children needed help, but we were under no time pressure and could all enjoy the opportunity to be creative. As we worked, the pots rather ambitiously evolved into lanterns. Our teacher took this all in his stride, albeit slightly amused by our ambition, and helped us to finish off our creations which were left to dry in the sun. 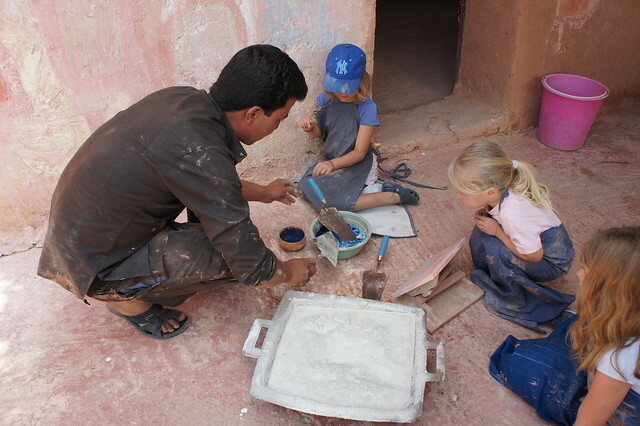 The next part of our class was to try our hand at Tadelakt, which is a traditional type of plaster used in Moroccan buildings. After selecting the colour, most important, we were encouraged to get our hands dirty, smooth the surfaces and start applying the mixture. 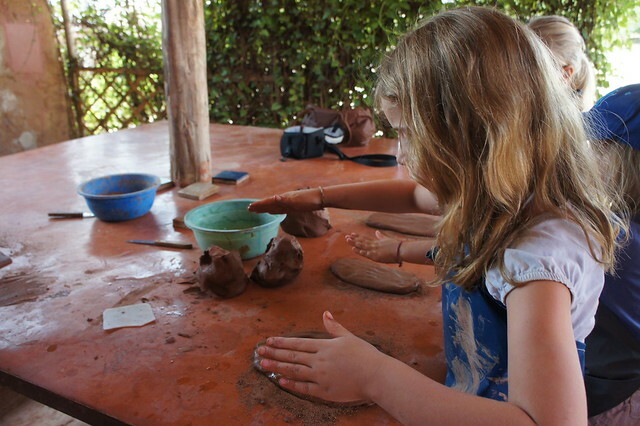 This was quite hard work for the children and they slowly started to lose interest, returning to the work table to make some pottery animals. My husband and I, meanwhile, were in our element, decorating the walls and trying to outdo each other’s creativity. Again, our teacher was on hand to give some friendly help. By the end of the session, we had earned ourselves a large lunch which we enjoyed whilst our works of art dried in the fierce midday sun. The biggest challenge of the holiday was getting our works of art back to the UK on the plane but they now sit proudly on our mantelpiece, complete with candles. The conclusion all round was that the class had been an overwhelming success. All five of us really enjoyed ourselves, a lovely way to spend a morning together.